Who else has received email from Jobs State Employment Ltd? The big question anyone thinks upon receiving unsolicited emails is are they legit or are they a scam? Is their name Jobs State Employment Ltd or Job Store Employment Ltd? Subject: Hello Cheryl. Job Store Employment Ltd. I received your resume from our HR department. Your resume has been selected from a large number of job seekers. If you are still looking for a employment, please let me know. I need your answer soon, because we need staff in your area urgent. · Company name: Job Store Employment Ltd. Very weird. I do not sign up with employment agencies. However, it’s possible sometime in the past I responded to a blind ad on Craigslist or Indeed that was placed by a personnel agency. When a job posting is placed by an employment agency, they have to identify themselves in the ad. That’s because there’s lots of people like me who don’t want to waste time responding to an employment agency. If they don’t identify themselves, it’s a violation of the posting rules on Craigslist and Indeed. Report them and their ad will be removed. Not that a scammer is going to care. They’ll just repost the ad. So, I don’t know whether I’m the victim of this employment agency violating terms by not identifying themselves in an ad I responded to back when I was looking for work, or if I’m just the victim of a random email. Also what’s weird is the company name is Job Store, but the website is jostore. And don’t waste your time clicking it, the account’s been suspended. Why don’t I deal with employment agencies? I have signed up with employment agencies in the past. I think in this day and age of the Internet, their usefulness has gone, unless they offer head-hunting for very specific niche industry jobs. After I quit working for Silverwing Holidays one summer many years ago, I applied for a job posting with an employment agency called Temporarily Yours. The position had to do with credit card processing and they needed several people. I went in all the way to Vancouver (about an hour by bus), filled out the application, spoke with a staff member, and didn’t get the job. However, I did get calls for occasional temporary work. When Translink was moving into new offices, I got called in for a week or two to help them catch up on their filing back log. There was another company in Richmond that I also worked for a week or two called Ashley-Koffman Foods. Again, I believe I was assisting in catching up the filing and photocopying, and it didn’t pay all that well. It was a bit of a drive, about 45 minutes, and that was if there wasn’t any traffic accidents or cars stalling in the Massey Tunnel! I got called back to work for them, I believe in December, but I wasn’t interested, and it conflicted with a part time job I also had found near my home. I also felt one of the supervisors wasn’t real nice to me, so I turned it down. A couple of things happened around Christmas. First, I quit the part time job, which I was planning to do anyway because I was heading down to Arizona and California for a couple of weeks over the Christmas/New Year’s season. When I returned, I had a couple of messages left on my answering machine from Temporarily Yours. Ashley-Koffman was anxious to have me back. Seeing as how I’d been using my credit card while on vacation, I was open to coming back, and this time they needed help in the order desk entry. Some of the staff were going on vacation, and they wanted to train me, and have me help with vacation coverage, it would probably be a month’s worth of work. And the pay increased by $2/hour! Long story short, Ashley-Koffman offered me a full time job and I stayed there four years until I was laid off. They closed down operations and moved to Calgary. I was sad. I did like that job. As for that not so nice supervisor, he actually turned out to be a very nice guy and we got along well once we got to know each other. When I got the news of the lay off, I contacted Temporarily Yours again and updated my file, thinking they’d helped me five years earlier, maybe they’d be able to find me a job again. Nope. Not even a nibble. While I searched for work, I noticed something about the ads the employment agencies were placing. They were pretty basic ads for a receptionist, a filing clerk, data entry, and so on. We’re not talking senior, highly experienced and educated positions here. I kept asking myself, surely these agencies already had applicants on file who’d be quite capable of filling these jobs, so why place ads? It’s mostly just to get a stable of good applicants on file, and then for these agencies to push their services on businesses who might be hiring. For a fee of course. The staff at these employment agencies earn commission on every applicant they bring in. Ashely-Koffman paid Temporarily Yours a “finders fee” when they hired me, which was a percentage of my salary. So I play along. I sent Shalonda a reponse. I have a really good job, but why don’t you tell me more about this available position. If it’s a really incredible job with a better salary and benefits plan, I would certainly consider it. A couple of days later Shalonda sends me a follow up email, ignoring my response, and saying hey I haven’t heard from you. Do you have any questions I can help you with? I believe I sent Shalonda an email telling her to go jump in a lake, but I probably didn’t put it quite that politely. On January 12, 2019, I received an email from Mary Maloney at Jobs State Employment Ltd. That is identical to Shalonda’s email, right down to the bad grammar! But now the company name has changed from Job Store to Jobs State. Subject: Hello Cheryl. Jobs State Employment Ltd.
· Company name: Jobs State Employment Ltd. I already responded to Shalonda Grenier on October 25, 2018 who sent me the exact same email below, and I still haven’t had the courtesy of a response! If this is the way your company operates, and is unable to respond in a timely manner, why would anyone want to do business with you? during working hours, and always ready to answer all your questions. I would like to know your opinion about my offer soon. Mary – if you’re always around your computer, answer my question from the last email. I need a quote for the scathing review of your company I’ll be writing on my blog. So as promised, Mary, this is the blog post that you’ve inspired! A couple of searches of the phone numbers lead to a couple of things. For the first phone number (604) 256-0163, there’s a discussion on Reddit when the first website was still live and the IP is in Poland. The other phone number (604) 800-1978 Googles to http://www.dreamzcanada.com/ another dead website. Clearly, this is some fly by night operation. The address on the website on Mary Maloney’s email is one of these places that’s like office space to rent for businesses who need a mailing address and a receptionist answering the phone. There are several businesses connected to this address. Using the current website address jobsstate.ca, the IP shows it’s in Ireland. And for those reading this post who are unaware of telephone number area codes, 604 is British Columbia. I don’t know what their scam is, other than harvesting personal information to use on future scams. Any Canadians (or people from other countries!) thinking of doing business with Jobs State Employment Ltd, I’d recommend you pass this one by. Legitimate companies don’t make clients jump through hoops to find them. 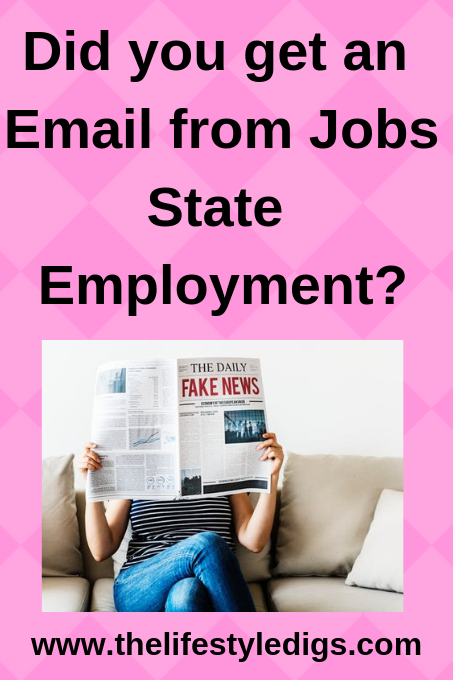 Who else has received an email from Jobs State Employment? Leave a comment below and let us know what happened.